Note: The anniversary file pages have over time been split and split again as they have grown. Please use the index at the foot of the page to find the month you want, where there is also a note about sources. A note on sources appears at the end. October 1895 (exact date unknown): Royal Ordnance Factories FC (the club that split from Woolwich Arsenal in 1893) turned professional, suggesting either that the split between ROFFC and Arsenal was not over professionalism, or more likely that the management of ROFFC changed its mind, on seeing the success of Woolwich Arsenal after 1893. 1 October 1870: David Howat born in Preston. He played for Fishwick Ramblers, and Preston North End, before moving to Woolwich Arsenal for whom he played between 1889 and 1896. 1 October 1913: Reginald Trim born this day in Portsmouth. He became the captain of England Schoolboys at left back, signing for Arsenal in April 1933 and remaining with the club until 1937 despite making just one first team appearance during all that time. 1 October 1925: The new tactics evolved at half time in response to the 7-0 defeat by Newcastle were tried out just two days later in an away game at West Ham. Arsenal won 4-0 and as Buchan said, “the novelty of Arsenal’s new methods took the other League clubs by surprise,” and by Christmas Arsenal were top of the league. 1 October 1930: 14 miners were killed in an explosion in the coal pit at Cannock. It is a tragic theme we find repeated throughout the 1930s. 1 October 1952: Arsenal and Racing Club de Paris continued their long series of friendlies. For the first time in the series Racing Club beat Arsenal 2 – 0. 1 October 1953: Derek Tapscott joined Arsenal from Barry Town for somewhere between £2000 and £4000 (depending on the source one reads). He had earlier had a trial with Tottenham, but was signed by Tom Whittaker after Tottenham turned him down. 1 October 1957: Ian Allinson born in Stevenage. He started out with Colchester Utd in became Young Player of the Year and a professional in October 1975. At the end of the 1976/7 season he scored the winning goal in the final game to gain promotion for the club. 1 October 1966: George Graham’s Arsenal debut and he scored – but the game finished Arsenal 2 Leicester 4. 1 October 1966: Bob McNab signed from Huddersfield. He had played for them 68 times between 1963 and 1966 before being signed by Bertie Mee in October 1966 – two months into his reign. 1 October 1969: Geoff Barnett signed from Everton for £35,000. Bob Wilson had a broken arm, and Mee was not sure about Malcolm Webster who had come up through the youth system. Webster did however make 3 appearances in 1969/70. 1 October 1994: Arsenal 1 Crystal Palace 2 left Arsenal with only two wins in the first eight league games. Even worse in five of those games Arsenal had failed to score. Arsenal were 14th, 14 points off the leaders, only 3 points off relegation in what was to be Graham’s final season as manager. 1 October 1988: With Frank McLintock as part of their coaching team Millwall went top of the 1st division. 1 October 2000 Arsenal beat Man U as Henry, with his back to goal flicked the ball up before pivoting to strike the ball over Barthez. It started a five game winning run for Arsenal and was Man U’s first defeat of the season. 1 October 2016: Alan Smith’s article “My complicated relationship with Arsene Wenger’s Arsenal” in the Telegraph sought to excuse his attack in that paper on the players of his ex-club relating to the Man U game in the Invincibles season, an attack made while he was contracted to Arsenal to undertake friendly interviews with the players; an attack for which he has never felt it was right to apologise. 1 October 2017: Arsenal beat Brighton 2-0 with goals from Monreal and Iwobi to make it 3 wins and a draw in the last four, after two earlier defeats to Stoke and Liverpool. 2 October 1909: Playing with an injured keeper throughout, Arsenal lost 0-7 to Blackburn. It was one of four defeats by this score that Arsenal have suffered in the first division. The next time they conceded seven was October 1922. 2 October 1915: Arsenal beat Clapton Orient in the wartime league, with Andy Ducat from Aston Villa in the team. He had played 175 games for Arsenal before being transferred to Villa in 1912. He later ended his career with Fulham – obviously the connection with Henry Norris remained throughout. 2 October 1920: A sense of impending doom swept the club as Arsenal lost 2-1 to Middlesbrough, having been 1-0 up for much of the game. The crowd of 25,000 was a disappointment too as the weather was particularly clement. 2 October 1922: Arsenal lost 1-2 away to Sheffield United. As a result of this defeat Arsenal were 19th, just one point above the relegation places and with a worse goal average than the two clubs one point below them. 2 October 1922: Frank Townrow (who joined Arsenal in November 1920, signing as a professional in April 1921) made his debut for the club. He only played nine times for the first team in five years at Arsenal. 2 October 1924: Arsenal had made an offer to Preston of £4500 plus Bob Turnbull, for England forward Tom Roberts who had scored 118 goals in 199 games – another example of Knighton’s reported £1500 transfer fee limit being shown to be nonsense. But on this day Roberts signed for Burnley. 2 October 1926: One year on from the game against Newcastle when Arsenal went six down in the first half, and then changed tactics, it started again, as Arsenal went 0-2 down to Newcastle in 15 minutes. And again a tactical change occured at half time and the game ended 2-2. 2 October 1937: George Hunt, the England international signed from Tottenham, made his debut for Arsenal against Manchester City on 2 October 1937. He went on to get a league winners’ medal, before moving on to Bolton for £4000. 2 October 1946: Albert Sigurður Guðmundsson played his first Arsenal match – a friendly against Sparta Prague, a 2-2 draw. He played throughout as an amateur, but the restrictive employment regime of the UK meant he had to leave the club shortly after. 2 October 1962: Barnet’s 75th anniversary match ended Barnet 2 Arsenal 5. 2 October 1971: Southampton 0 Arsenal 1 (23,738 being crammed into the Dell). The Observer called the Southampton tactics after Arsenal scored akin to a “pre-historic assault” rather than football. 2 October 1974: A testimonial match at Reading gave O’Leary, Ross and Rostron their first games. 2 October 1993: Liverpool 0 Arsenal 0. This was the first of four successive 0-0 draws in the league. The sequence ended on 6 November with a 1-2 home defeat to Aston Villa. 2 October 2011: An away defeat to Tottenham 2-1 meant that after five games with just one win, Arsenal were 17th, the lowest point in the table under Wenger thus far. 2 October 2016. Away to Burnley Laurent Koscielny scored in the last minute to win the game. Burnley manager Sean Dyche questioned the referee’s competence after the game claiming the goal was both offside and handball. Although such attacks on refereeing competence by managers are prohibited by the PL no action was taken. 3 October 1896: Arsenal played their second game in the United League – a 2-2 home draw against Luton Town – with a not insignificant crowd of 8000 – very high for the United League. 3 October 1903: 20,000 in crowd for the Man U home game, compared with 1,000 for the next away game! Arsenal won 4-0, making it 21 goals for and 0 against in the first five games of the season. The next game was away to Glossop. 3 October 1914: Arsenal were away to Leeds City (managed by Herbert Chapman) and secured a 2-2 draw with 12,000 in the crowd. One of the earliest meetings between Chapman and Henry Norris. 3 October 1917: Eddie Carr born. At 17 he signed as an amateur for Arsenal, going first to the Margate nursery club, and turning professional in time for the start of the 1936/7 season. 3 October 1925: Arsenal lost 0-7 to Newcastle. 0-6 down at half time Chapman changed tactics – but the introduction of WM did not happen at this point as Buchan suggested in his autobiog. This was the third 0-7 defeat for Arsenal in the first division – and certainly the one with the most implications. Buchan’s 1st signing Transforming WM. 3 October 1931: Arsenal lost to Grimsby 3-1 – one of the shocks of the season – it was only the second time 1st division Grimsby had ever beaten Arsenal. Lambert got Arsenal’s goal and 17,840 turned up to witness the event. The only relief for Arsenal fans was that Tottenham lost 4-2 to Chesterfield. 3 October 1936: 79th and final league appearance of Pat Beasley v Man Utd. He was signed by Chapman but missed out on honours. However he played in the cup final of 1938 for Huddersfield, and guested for Arsenal during the war. See also here. 3 October 1958: Jackie Henderson signed from Wolverhampton for £17,500. Wolverhampton hardly used him as they became champions and sold him on at a profit. 3 October 1958: John Snedden joined as an amateur from Bonnyvale Star Juniors. Turning pro a few months after joining he started his career on 16 January 1960 in a game away to Tottenham, his only game of that season. 3 October 1970: On the way to the double Kennedy scored his first hattrick as Arsenal beat Nottm Forest 4-0 in match 11 of the first Double season. The start of a 14 match unbeaten run. 3 October 1972: John Roberts final game in league cup v Rotherham. He later featured for Wrexham and Hull City and finally for non-league Oswestry Town. He subsequently went on to work as a stationery salesman and as a driving instructor. 3 October 1979: Arsenal drew 0-0 away to Fenerbahce. Thousands spent the night shouting abuse in front of Arsenal’s hotel, fans ambushed Arsenal’s coach to stop Arsenal training on the pitch, armed troops faced the crowd, riot police protected the dug out in the game. Arsenal played it cool despite pitch invasions and everyone got out alive. 3 October 1989: Arsenal beat Plymouth 6-1 away in the League Cup in front of 17,360. Thomas (3), Smith, Groves and OG. Having beaten Plymouth 2-0 at Highbury Arsenal went on to beat Liverpool before losing to Oldham. 3 October 1999: The run of three victories through September was disrupted by an away defeat to WHU. Vieira confronted Ruddock and was subsequently charged, banned for six matches and fined a record £45,000 by the FA. He apologised in a very personal commentary about his family and his brother. 3 October 2014: Brian Mcdermott returned to Arsenal after being sacked by Leeds as manager and joined the scouting team, as assistant to the chief scout. 4 October 1894: Woolwich Arsenal beat Casuals 8-0 in a friendly. This is one of the matches that shows that the old story that Arsenal were banned from playing local amateur clubs after turning professional in 1893 was completely untrue. 4 October 1913: The first league defeat at Highbury. Arsenal 0 Bury 1. The two previous games at the new stadium had been a win and a draw. The next 8 games at Highbury were all home wins – the only other home defeat came against Huddersfield in February. 4 October 1936: The nation was appalled to receive the news of the Battle of Cable Street between Oswald Mosley’s British Union of Fascists who dressed in uniforms that were based on those of the Blackshirts, and anti-fascist demonstrators. 4 October 1942: Terry Mancini born. He made little progress at first as a player but after a period in South Africa, returned to England to push his way up through the leagues with Orient and finally QPR before joining Arsenal. 4 October 1952: Arsenal 3 Blackpool 1. 66,682 turned up for the game despite Arsenal’s modest form at the time (only four of the first 10 games had been won). Roper got two and Logie the third. 4 October 1958: One day after signing, Jackie Henderson made his Arsenal debut v WBA where he scored twice as Arsenal won 4–3 at Highbury. 4 October 1969: Arsenal 0 Coventry City 1. Geoff Barnett and John Roberts made their league debut. The game came in a run of eight games without a victory. The crowd was 28,877. 4 October 1972: Jeff Blockley signed from Coventry City for £200,000. As Arsenal tried to maintain the momentum of the first European success and the first Double, he was signed by the club as a replacement for Frank McLintock. 4 October 1973: Wilf Rostron signed a professional contract with Arsenal and played 17 games with the club between this date and 1977, when he moved to Sunderland. He later played in Watford’s successful side in 1982. 4 October 1974: A month after sacking Brian Clough, Leeds United finally appointed Jimmy Armfield of Bolton Wanderers as their new manager. The following day Leeds celebrated by beating Arsenal. 4 October 1975 Arsenal lost at home 2-3 to Manchester City. It left Arsenal with just one home win in the first five games at Highbury in the season. In the face of such a record it made 24,928 seem a fairly decent crowd. 4 October 1977: Despite endlessly being lauded as the greatest team of all time Liverpool had in reality developed an approach of mass defensiveness away from home. The result on this day of Arsenal 0 Liverpool 0 in front of 47,110 consisted largely of the keepers kicking the ball to each other down the length of the pitch. 4 October 1986: The start of an 18 match unbeaten run which ended on 24 January 1987. Arsenal then went through a ten match run without winning a game including six consecutive games without scoring. 4 October 1997: Ian Wright’s last goal at Highbury in a 5-0 win over Barnsley as Arsenal remained unbeaten with a third of the season gone, and Bergkamp was in his pomp and glory. 10th league game of the 2nd Double Season The second double: part 1, part 2, part 3. 4 October 1998: Bergkamp scored his first league goal of the season in the defeat of Newcastle at the start of a six match unbeaten run. 4 October 2003: Liverpool 1 Arsenal 2. The 8th league match of the unbeaten season including an utterly sensational goal from Pires. 4 October 2009: Having started the season so well, then faltered, Arsenal recovered beating Blackburn 6-2. Each goal was scored by a different player: Vermaelen, Van Persie, Arshavin, Fabregas, Walcott, Bendtner. 4 October 2015: Arsenal 3 Manchester Utd 0. Arsenal scored their goals in the first 19 minutes through Alexis (2) and Ozil. 5 October 1896: Rushden Town 5 Woolwich Arsenal 3, United League This was Arsenal’s first season in the league, in which they generally played their first team players. They continued in the league for three years after which they moved into the Southern District Combination. 5 October 1904: Reginald William Tricker (known as Reg) was born in Karachi and moved to England in 1908 with his family. Reg joined Arsenal from Charlton Athletic for £2,250 on 12 March 1927, before making his full debut just one week later in a 2-1 defeat at home to Everton. 5 October 1912: After starting the season with four successive defeats Arsenal recovered with three unbeaten including this 0-0 draw with Oldham. However the relief was short lived as Arsenal did not win again until March. Also on this day Aston villa beat The Wednesday 10-0. 5 October 1919: The rail strike was called off after the employers caved in to workers demands. Simultaneously the Met Police launch their first mobile patrol unit using horse drawn carriages. 5 October 1922: Sir Henry Norris, William Hall, Charles Crisp, John Humble, Leslie Knighton, and the Arsenal players involved in the match against Tottenham, plus the directors, managers and players of Tottenham, were summoned to an FA Commission of Inquiry into the game played at White Hart Lane on 23 September. 5 October 1923: Albert Sigurður Guðmundsson – the Arsenal player who became Icelandic Minister of Finance, was born. 5 October 1927: Samson Haden sold to Notts County for £1350. He went on to play 289 league games for Notts C, scoring 36 goals. Later he became player manager and manager of Peterborough, but after that we lose sight of him. 5 October 1929: Cliff Bastin league debut for Arsenal in a 1-1 away draw against Everton. He went on to play 21 games in his first season, scoring seven. 5 October 1936: Gerry Ward born in Stepney. He was signed by Tom Whittaker who was convinced he had a great future at the club, and made him the youngest ever player to start a match for Arsenal. 5 October 1953: First game for Len Wills in the floodlight opening friendly at QPR which Arsenal won 3-1. He first played for Eton Manor FC, an amateur club formed by several well-to-do families to support young men and boys in the East End of London. 5 October 1964: Frank McLintock signed from Leicester for £80,000. He had played in two Leicester cup final sides (1961 losing to Tottenham, 1963 losing to Man U) but won the League cup final in 1964 beating Stoke over two legs. 5 October 1966: Debut for John Woodward v WHU, in the league cup. Arsenal lost 1-3 at Highbury, with David Jenkins scoring his only goal of the season. John made just two starts and came on once as a sub for Arsenal. 5 October 1970: Arsenal beat Tottenham at Highbury. Later they did it again at White Hart Lane in the last match of the season to win the league. 5 October 1974: A month after sacking Brian Clough, Leeds United finally appointed Jimmy Armfield of Bolton Wanderers as their new manager on 4 October. On 5 October Leeds United celebrated by beating Arsenal. 5 October 1976: Arsenal played Blackpool (the exponents of anti-football) at home in the League Cup for the third time and finally won 2-0, in front of 26,791 who clearly thought it couldn’t be as bad as the last two games. Stapleton and O’Leary broke the 11 man defence..
5 October 2004: The name “The Emirates Stadium” was announced, with naming rights granted for 15 years alongside an eight year shirt sponsorship deal. The price was about £100m. Although the name did not leak out in advance, Arsenal did start buying web sites with EmiratesStadium in them although they forgot EmiratesStadium.info which Untold Arsenal used when it opened in 2007. 5 October 2014: Arsenal lost their first league game of the season 0-2 to Chelsea. Much was made of the fact that Arsène Wenger had not beaten José Mourinho in 12 games, and that Arsenal had dropped to 8th in the league. 6 October 1894: James Henderson scored in the 5-2 win over Lincoln to continue his all time record breaking run and exactly reversed the score between the clubs on 1 September 1894. 6 October 1894: Luton’s first match in the Southern League. They have claimed to have been a professional team before Arsenal, but records suggest only two or three of their players were professional in 1891, when Arsenal turned fully professional. 6 October 1988: Preston beat Stoke 7-0, with Jimmy Ross scoring four. When in December 1935 Ted Drake created the all time record of scoring seven in one game the story was put about that Drake’s achievement was not a first and that Ross had done the same on this day. It was a complete fabrication. How strange someone should bother to make it up just to knock Arsenal! 6 October 1900: Archie Cross league debut: a 1-1 away draw with Blackpool. He played just three games at right back that season, but started out the following season as a first choice player in that position. 6 October 1906: Arsenal 2 Liverpool 1 took Arsenal to the top of the league for the very first time ever, and this despite a 4-1 defeat to Bury in the second match of the season. 6 October 1910: Having played in the Scottish Cup Final inthe spring, Jackie Chalmers was signed by Woolwich Arsenal on this day and made his debut just two days later on the 8th for the away game with Bradford City. 6 October 1916: As the horrors of trench warfare unfolded an Army Order was issued removing the requirement for soldiers to wear moustaches. 6 October 1919: Tommy Lawton was born in Farnworth, Lancashire. He signed for his first club, Burnley in 1935. In 1937 at the age of 17 he moved on to Everton for £6500 playing next to Dixie Dean. He quickly made it into the England team. 6 October 1922: Sir Henry Norris wrote in the Fulham Chronicle on his withdrawal from politics saying he was not willing to accede to the demands of his local party. This is a vital moment to understand in relation to the way that Sir Henry was able to walk away when felt wronged; exactly as he subsequently did from football. 6 October 1934: Stoke City 2 Arsenal 2 with Bowden and Hapgood returning for the game. Stoke were fifth in the league, just one point behind Arsenal, having won all three home games thus far scoring 12 and conceding one. Arsenal had not yet won away from home; Bastin got both the goals taking his league total to seven in ten. 6 October 1948: Arsenal 4 Manchester United 3. Charity Shield match played at Highbury with a crowd of 31,000. Lewis got two, Rooke and Jones one each. 6 October 1956: Cliff Holton became the first player since Jack Lambert to score more than three goals for Arsenal in a single game. The result was Arsenal 7 Manchester City 3. Holton (4), Evans Bloomfield and Haverty. 6 October 1962: Tommy Caton born in Liverpool, started out with Man City in 1978 and played in the cup final aged 18. By the time he was 19 he had played 100 first division games, and although obviously not a goal scorer by trade he did score two against Arsenal on 4 December 1982. 6 October 1962: Tottenham 4 Arsenal 4 (Court 2, McLeod and Strong). 61,749 attended the game. The week before Tottenham had beaten Nottingham Forest 9-2, and in this game went three up in 26 minutes. Arsenal eventually went 4-2 down but battled back to get the point. 6 October 1964: Debut for Frank McLintock – a 0-3 home defeat to Nottingham Forest in a run of four defeats in five matches. McLintock however was not blamed for the problems and took over the No 4 shirt from Geoff Strong for most of the rest of the season. 6 October 1966: Niall Quinn born. He played first for Manortown United and after an unsuccessful trial at Fulham he signed professional forms Arsenal in 1983. 6 October 1970: Arsenal 1 Luton 0 in League Cup. David Court played for Luton. Arsenal went out to Crystal Palace in the next round after a replay. But when thinking of 1970/71, no one thinks of the league cup. 6 October 1971: Arsenal 4 Newcastle 0, in the league cup, 34,071 in the crowd. Wilson had nothing to do other than contemplate going back into teaching. Radford scored to celebrate his recall to the England squad, Kennedy, Graham and Simpson scored the others. 6 October 1979: Arsenal 0 Manchester City 0. 34,688 in the crowd. In the subsequent press conference Allison praised Rix and said he should be in the England squad. No one talked about the game: it was too poor to mention. 6 October 1981: Arsenal lost 0-1 to Sheffield United in League Cup. Fortunately there was a second leg to come, which Arsenal won 2-0 in extra time. 6 October 1984: Arsenal returned to the top of the league with a 1-0 win over Everton, Charlie Nicholas scoring a penalty. It was one of five consecutive wins. 6 October 2002: Arsenal beat Sunderland 3-1 to make it 7 wins and 2 draws in 9 – and 30 consecutive unbeaten in all – a new Premier League record. It was the last game of the sequence – Arsenal lost the next match. 6 October 2012: Olivier Giroud scored first goal in 3-1 away win against WHU. He also set up the second goal for Walcott. Santi Cazorla got the third. 6 October 2013: The Arsenal History Society presented a 10 year comparative analysis of the first six games of the season in order to overcome hype about best and worst starts to a season, which was the chatter of the day. 7 October 1908: Debut of Angus McKinnon in game against Rest of Kent. (Woolwich Arsenal won 3-0). Having signed from Petershill he went on to play 211 league games for Arsenal. 7 October 1909: Having lost the previous game 7-1 with the injured McDonald in goal, Fisher took over, but despite being fit was little improvement as Arsenal lost 5-1 to mid-table Notts County. 7 October 1916: Dicky Roose, Arsenal goalkeeper, and one of the most flamboyant of players of the era was tragically killed in action in the Battle of the Somme serving his country in the first world war. See also here. 7 October 1920: Knighton purchased Harold Walden – Bradford City’s top scorer in their 1911/12 campaign. In many ways this was a publicity stunt as the man was also a music hall entertainer. It’s a fascinating but rarely told story and (in my opinion) well worth following the link to read the detail. 7 October 1922: The Prince of Wales was the first member of the royal family to do a radio broadcast. Meanwhile Arsenal beat West Bromwich Albion, 3-1 which lifted the club from 20th to 16th. 7 October 1931: Arsenal beat WBA to win the Charity Shield at Villa Park. 7 October 1933: Final match for Alf Haynes. He moved to Crystal Palace two months later, where he played for three seasons before suffering a very serious injury. 7 October 1947: Birth of Patrick Howard near Barnsley. He played for Barnsley and Newcastle before being brought in as an emergency central defender for Arsenal by Terry Neill, during Neill’s first season as manager. 7 October 1976: Gilberto Silva born. He started as a footballer in 1997 with a tiny local team, and by 2002 he was playing all of Brazil’s games in the World Cup finals. It was quite a rise to success in five years. 7 October 1986: Arsenal drew 1-1 away with Huddersfield in league cup, Martin Hayes scoring. However Arsenal had already won the first leg 2-0 and so went through. 7 October 2014: Brian McDermott returned to Arsenal as a scout and eventually became chief scout having managed Reading and Leeds Utd. 8 October 1891: Royal Arsenal beat Royal Engineers Training Battalion 8-0. 8 October 1910: A 0-3 away defeat to Bradford City meant Arsenal had not won any of their first seven league games and had scored just two goals in those seven matches. 8 October 1914: The Arsenal Football and Athletic Company Limited became The Arsenal Football Club Limited with the launch of the new share issue. The first public presentation of the name (other than on the new shares) was not seen however until 26 October when the programme for the Football League vs the Southern League representative match (played at Highbury) was put on sale. 8 October 1921: Sunderland 1 Arsenal 0. Having won the first game of the month Arsenal now lost four league matches in a row to stay bottom of the league and already looking relegation certainties. 8 October 1930: Arsenal won the Charity Shield for first time beating Sheffield Wednesday in a match played at Stamford Bridge in front of 25,000. Arsenal were in the game having beaten Huddersfield Town in the FA Cup final the previous April. 8 October 1932: Final appearance of Tom Parker – the club’s first trophy winning captain. He became player manager of Norwich City and took them to the championship in 1933/4. He played 172 consecutive league games for Arsenal (a record) and in all played 258 league games for the club in addition to 246 for Southampton. He later managed Southampton before returning to Norwich for a second spell. He died at the age of 89 in 1987. 8 October 1936: Pat Beasley sold to Huddersfield for £750. He later moved to Fulham with whom who won a second division champions medal, was player manager for Bristol City, and manager of Birmingham, from 1950 to 1958. See also here. 8 October 1960: Last senior game for Jimmy Bloomfield. He was transferred to Birmingham, where he spent four years, played in a second Fairs Cup final, again on the losing side, before winning the league cup with Birmingham in 1963 scoring a goal in the final. 8 October 1991: Jimmy Carter signed from Liverpool for £500,000. During the 3.5 years Carter spent with Arsenal the club won three different cups, but Carter managed only 25 games and two goals and did not play in any of the finals. 9 October 1897: Arsenal boasted a crowd of 14,000 for second time in the league, in a 3-0 win over Luton, perhaps reflecting anticipation among the crowd over the fact that Arsenal had beaten Luton 2-0 away the previous week. 9 October 1905: Arsenal beat West Ham 3-2 in the Southern Professional Charity Cup before going on to beat Tottenham and Reading to win the trophy. 9 October 1909: Arsenal 0 Nottingham Forest 1. It made three defeats in a row, but at least the goal avalanche against the club (12 in the last two games) had stopped and there was a slight hope for better times. G Fisher, the replacement keeper, played his second and last game for the club. .
9 October 1910: Jack Crayston born. He played over 200 games for Arsenal from 1934 to the outbreak of war winning the league twice and FA Cup once. He became assistant to Tom Whittaker in 1947 as manager and then took over on Tom’s death. He was the first manager since Herbert Chapman (appointed 1925) not to win the league and cup in his spell in charge. 9 October 1914: The Arsenal Football And Athletic Co Ltd became The Arsenal Football Club Ltd – as Henry Norris launched a new share issue continuing to sell the club to local supporters. 9 October 1915: A crowd of just 2500 turned up at Watford to see the home team beat Arsenal 1-0. It was clear that wartime football was not a hit with supporters. 9 October 1919: The FA which had been investigating Leeds City FC (previously managed by Herbert Chapman) stated that the club could not play its game against South Shields the following Saturday because of “irregularities” during the war. 9 October 1920: Having played three games without a win, Arsenal got a goalless draw at home to Bolton in front of 38,000. The local paper now got ever more angry with the Arsenal forward line and didn’t appreciate the lack of goals. 9 October 1926: The extent of Chapman’s failure to maintain the club at the standard of his first season at Highbury was fully revealed as going into this game Arsenal still had not won away this season, and this continued against mid table Newcastle, with Arsenal losing 0-2. Arsenal slipped down to 14th. 9 October 1971: After four league wins in a row Arsenal beat Newcastle 4-2 regaining the style and zest of last year’s Double team with Kennedy George, Radford, Graham and Armstrong all shining. Newcastle’s goals, both from Macdonald came in the last few minutes, and in fact he could have had a hat-trick at the very end but for Wilson’s fine save. 9 October 1976: Steve Gatting made his first appearance as sub in Peter Simpson Testimonial. He had joined Arsenal as an apprentice in July 1975 and became a professional footballer two years later. 9 October 1979: Arsenal beat Ipswich Town 2-1 at Portman Road in front of 22,527.. Rix and Brady ran the show but the highlight was the Ipswich keeper throwing the ball out only for it to hit the ref on the back, it rolled to Hollins who passed to Sunderland who chipped the keeper. A masterpiece. 9 October 2001: Frank McLintock announced an auction of his medals, shirts and memorabilia. He said that he was not struggling for cash, but since the medals etc were in a bank vault he never saw them. 10 October 1896: A 5-1 home defeat to Millwall Athletic showed that even three years into their league career, Arsenal were not automatically the top club in the area. 10 October 1903: J G “Tim” Coleman set a club record in scoring in each of the first 6 league matches – getting nine goals in all. 10 October 1910: Arsenal played away to Millwall in the London FA County Cup, probably the last game at Millwall’s Isle of Dogs ground. Only 3000 being in attendance for a game which had on other occasions secured crowds of 20,000 plus. Arsenal found the same situation in 1913 when they left Woolwich. People did not turn up to say goodbye. 10 October 1921: An unusual event at Highbury: England played Australasia at Highbury in a “Northern Union” match – what today we would call Rugby League. The New South Wales Rugby Football League had been formed in 1908 and this was their first tour. 10 October 1925: Arsenal 2 Bolton 3 – it was only Bolton’s second away win of the season with just nine goals in the previous five away games. What makes this so important is that Buchan claimed in his memoirs that he sat down with Chapman after the 7-0 defeat to Newcastle on 3 October and transformed Arsenal’s playing style and that this was an instant success. But here they were two games later, losing to a very modest club indeed. Yet he utterly fails to mention this game in his book. 10 October 1931: Blackpool 1 Arsenal 5, Blackpool having previously been undefeated at home in the season. Bastin got a hat trick, Hulme and Lambert the other two. One of Bastin’s goals was a penalty – Arsenal’s first of the season. The result took them back to third. 10 October 1942: Bremner played for Scotland in the wartime international against England. Marks, Hapgood and Dennis Compton played for England. 10 October 1950: Charlie George born. He played for Islington Schoolboys before joining Arsenal in May 1966. He turned professional in 1968 and made his first-team debut for the club on 9 August 1969. 10 October 1956: Arsenal continued their regular friendlies against Racing Club de Paris, this time winning 4-3. 10 October 1960: Arsenal played Northampton to celebrate the first floodlit match at the County Ground. Arsenal were selected as opponents as Northampton had ex-Arsenal man Dave Bowen at their manager. Also with a look back to Herbert Chapman who managed both clubs and who had arranged previous friendlies against the club. 10 October 1964: Arsenal lost 3-1 to Tottenham in Geoff Strong’s last game. Joe Baker scored. The score was exactly reversed in the return game the following February. 10 October 1966. Tony Adams born. He signed for Arsenal as a schoolboy in 1980 and made his first start for the first team on 5 November 1983 against Sunderland when he was just past his 17th birthday. 10 October 1970: Newcastle 1 Arsenal 1. League match 12 of the first Double season; George Graham got the goal. It meant Arsenal had won exactly half of their league games thus far. 10 October 2000: The hearing was held on the allegation that after the Arsenal Sunderland game Mr Wenger, who until that moment had an utterly unblemished record as a manager, had indulged in violent or threatening behaviour against Mr Taylor, the fourth official at Sunderland. Mr Wenger was banned for 12 matches.for “improper conduct”. It was eventually rescinded on appeal. 10 October 2013: Fans groups wrote to Mr Kroenke requesting he honour his pledge made in 2011 to meet Arsenal fans groups. 11 October 1880: Birth of Jimmy Sharp who played over 100 times for Arsenal between 1905 and 1908. 11 October 1890: First recorded appearance of Jack Humble as an “umpire” (ie ref) v 93rd Highlanders. Newspaper reports suggest that he should stick to administering the club, rather than try umpiring, which he did, becoming Woolwich Arsenal’s first chairman, launching the club into the League in 1893. 11 October 1899: The Second Boer War started. Overtime had been compulsory in most Woolwich Arsenal workshops from 1898 onwards and this, plus a rise in prices to watch matches had a serious negative effect on Arsenal’s crowds. 11 October 1902: Arsenal beat Bristol City 2-1 in front of highest league crowd thus far: 16000. Gooing and Hunt scored. 11 October 1913: Frederick Groves signed as a pro, having played for Barnet Albion and Glossop North End before signing as an amateur player in August 1912. On the same day Arsenal beat Huddersfield 2-1 away. 11 October 1913: After the Man U v Burnley match on this day there were allegations of a betting scam, and ultimately one Man U player was jailed. But for several years the FA ignored both the complaints from Norris over the Liverpool match he witnessed and this game and were only forced to act in 1915 by the refusal of betting companies to pay up due to match fixing. 11 October 1919: Joseph Toner made his league début against Everton which Arsenal won 3-2. He appeared at number 11, replacing FW Groves who moved to inside right. He got a run of 10 games at outside left before losing his place to CH Lewis. See also here. 11 October 1924: Arsenal lost away to Huddersfield 4-0: an opportunity for Sir Henry Norris to meet Herbert Chapman and see his work in progress. 11 October 1930: In the pre-floodlight days, matches kicked off at 3.30pm up to this day, and then the starting time retreated until from November to January it was 2.30pm. The 1930 Arsenal handbook gave the times for 1930/31 – one of the few places to print out the full details of kick off times. 11 October 1952: Arsenal 2 Sheffield Wednesday 2. Arsenal were yet to show the form that ultimately won the title on the last day of the season, but the supporters clearly saw something positive happening, as 55,678 turned up. 11 October 1972: Jeff Blockley won his one England cap. Unfortunately with the team starting to decline he failed to blossom as an Arsenal player and he left for Leicester in 1975. 11 October 1972: John Roberts transferred to Birmingham, having played 59 league games for Arsenal, scoring five goals. After Birmingham he moved on to Wrexham for whom he played 145 times. 11 October 1975: After six without a win Arsenal beat Coventry 5-0 in the league. The scorers were Cropley 2, Kidd 2 and Ball. Although it was a very poor season Arsenal did once exceed this score beating WHU 6-1 at home on March 20. 11 October 1976: John Devine signed as a professional. By the time of the 1980 cup final he was chosen ahead of Sammy Nelson and was part of the Cup Winners Cup squad for the final, but his career was cut short by injury. 12 October 1893: Arsenal beat London Caledonians in a friendly 10-3 with the Chairman of Woolwich Arsenal Jack Humble in the side. 12 October 1884: Jock Rutherford was born. He won three league titles and an FA Cup winners medal with Newcastle, before moving to Arsenal in 1906. 12 October 1912: Arsenal 0 Chelsea 1 in front of 20,000. The result left Arsenal with only one win from the first eight, and the press report made particular mention of the jubilation of the visiting fans as Arsenal started a run of 23 without a win. It was the first time Chelsea had beaten Arsenal since the very first match between the two. 12 October 1915: Patriotic fever grew as the news was released that British nurse Edith Cavell had been executed by a German firing squad for helping British soldiers escape from Belgium. 12 October 1918: With German forces in retreat US President Woodrow Wilson, began his efforts to broker a ceasefire in World War 1. 12 October 1919: Arsenal had an attendance of 30,000 for the game against Tottenham – the first post-war attendance to reach this figure. 12 October 1923: The Arsenal squad, manager and directors, went to the Alhambra theatre, in Charing Cross Road for a special showing of a movie which contained footage of Arsenal playing a match. It story got large press coverage and Arsenal were portrayed as the team of today’s new technology. A typical, clever, piece of Sir Henry PR. 12 October 1925: Arsenal beat Fulham in the London FA Challenge Cup 4-0 with 3897 in the crowd at Highbury. This was the game with Bob John playing at left back. While Male is the example of Chapman changing a player’s position most commonly quoted, John was the first such experiment, and a friendly on 14 October was also arranged to test this further. 12 October 1935 Don Howe born; one of the men who both played for Arsenal and managed the team. 12 October 1940: Dave Bacuzzi born in Islington. His Arsenal career took off with two promising seasons at right back, before he moved back to the Reserves with whom he won the Combination. 12 October 1946: Arsenal drew 2-2 with Brentford. It meant that with 10 games played Arsenal had won just two, lost six and drawn two. 12 October 1953: Arsenal 3 Blackpool 1 at Highbury in the Charity Shield – making it the 7th time Arsenal had won the trophy. It was however Arsenal’s last appearance in the Shield until 11 August 1979 (they didn’t play the 1971 game). 12 October 1965: Arsenal played Israel in a friendly. The result was a 2-2 draw. 12 October 1994: Northampton’s three sided ground closed after this final match; with their new ground ultimately incorporating the Dave Bowen stand, named after the ex-Arsenal player who became the most successful Northampton manager in the club’s history. 12 October 1996: Arsène Wenger’s first match, a 0-2 victory at Blackburn. Up to this moment he had been seeing out his contract in Japan. Ian Wright scored the first Wenger goal. 12 October 1999: Only 15,239 turn up for the league cup game v Preston. Arsenal won 2-1. Kanu and Malz scored. 13 October 1894: Henry Boyd, Arsenal’s most prolific scorer ever, scored his 8th goal in five games. The result was Newton Heath 3 Arsenal 3, part of a seven match unbeaten run. 13 October 1906: One of the first known press references to Arsenal supporters as “Gunners”. The name originally turns up in 1904, but this report in the Bristol Evening News also particularly mentioned the antics of the supporters who worked in the Torpedo Factory and the fireworks they let off. It was most likely this group who popularised the name. 13 October 1917: In an attempt to divert discontent and improve the nation’s spirit in wartime the government took over Chelsea’s Stamford Bridge ground on this day to celebrate the (largely imaginary) life of the great English heroine Boadicea. 13 October 1919: Leeds City FC of the second division were expelled from the Football League and their directors and their wartime manager, Herbert Chapman, were banned from football for life. 13 October 1919: The conviction of Mr James Matthew Littleboy, a former mayor of Fulham, for annoying ladies in Hyde Park, was quashed. The ex-Mayor, who said he was troubled by noises in his head, was supported by Sir Henry Norris who vouched for his good character. 13 October 1923: Arsenal 1 Manchester City 2. The Times described Arsenal as “tame” with City playing an offside trap and a counter-attacking game that thus far had not been common in the first division. Arsenal’s defeat meant that after a run of three wins they had now scored one goal and got one point in the last three games. 13 October 1928: Arsenal smashed the world transfer record with the purchase of David Jack by Herbert Chapman for £10,890. The tale is that Chapman got the negotiators from Bolton drunk to get the deal done. 13 October 1934: 68,000 turn up for the home game with Man City. Arsenal won 3-0 (Bowden 2, Bastin) and was part of a run of 15 goals in four games. 13 October 1959: First game for John Snedden in friendly v Grasshoppers. Arsenal won 8-2. 13 October 1960: Arsenal signed John McClelland from Glenavon for £7000. He had one major season with Arsenal – 1962/3 where he replaced McKechnie in goal and played 33 games. 13 October 1971: Bob Wilson and George Graham played for Scotland for the first time. It was one of just two caps for Bob Wilson. Graham played 12 times for his country. See also here. 13 October 1979: The 11th league game of the season and the difficult reality was that Arsenal had only won three of the previous ten, and matters didn’t improve much with a 0-0 away draw at Bolton in front of 17,032. 13 October 1990: Final game for Gus Caesar in the Graham Rix Testimonial match v Tottenham. Arsenal lost 2-5. 13 October 2001: Southampton 0 Arsenal 2. League match 8 of the third Double season. Pirès‘ scored in the 5th minute and Henry wrapped it up with the second on 74 minutes. Arsenal were second in the league, having won five, drawn 2 and lost one. 14 October 1893: Arsenal’s record FA Cup score of all time came in their first FA Cup match as a league club, beating Ashford 12-0. See also this article for the full cup run. 14 October 1903: Alex “Sandy” Main made his final appearance as a centre forward before on 1 November suddenly turning up as a centre half for a run of six games with Arsenal winning five of the run. 14 October 1913: Britain’s worst ever pit disaster. 439 miners died in the Senghenydd Colliery Disaster. 14 October 1915: British troops used poison gas on the battlefield for the first time. 14 October 1922: Arsenal lost 0-7 to West Bromwich, as Henry White faded away and Arsenal started a run of 8 without a win. It was the second time Arsenal lost 0-7 in the first division – the first being 2 October 1909. 14 October 1933: Arsenal beat Newcastle 3-0 but injuries meant that only two players had played all 10 of the opening league games and now Jack sustained a long term injury and would not play again until 24 February. 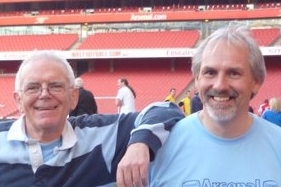 Birkett, Bowden and an OG gave Arsenal the win. 14 October 1972: Arsenal 1 Ipswich Town 0 with 34,196 in the ground, and George Graham scoring. Armstrong was injured (Marinello taking over) and Simpson was replaced Roberts. Next month Roberts was replaced by Blockley. Barnett was in goal with Wilson injured. The Double team was vanishing fast. 14 October 1978: Wolverhampton 1 Arsenal 0, 19,664 in the crowd. The team seemed to be made up of “almost” players: Devine, Harvey, Vaessen, Kosima, Heeley, Stead, and later McDermott, Brignall… the names came and went with only Walford looking like he might be there for the long haul. 14 October 1997: Jason Crowe who played 3 times for England’s under 20s, came on as a sub and was sent off 33 seconds into his debut in a league cup which ended Arsenal 4 Birmingham 1. In the same game Jehad Muntasser came on two minutes before the end, and was transferred soon after, giving him the shortest ever Arsenal career. Crowe went on loan to Palace, moving on to Portsmouth, Grimsby, Northampton and other clubs before closing his career at Corby Town in 2013. Muntasser played in Serie B and C in Italy and became a major force in helping children affected by the 2011 Libyan revolution. Other débutantes in the game were Manninger, Upson, Vernazza, and Mendez. 15 October 1909: Ehud ‘Tim’ Rogers was born in Chirk. He played through a variety of local and lower league clubs before being brought in as a possible long term candidate for right winger in the championship winning squad. 15 October 1910: Arsenal 4 Blackburn 1. Arsenal’s first win of the season after eight games. Arsenal had failed to score in the previous five. 15 October 1914: HMS Hawke was torpedoed by a German U-boat in the North Sea and sank in less than 10 minutes with the loss of 524 lives. 15 October 1919: Sir Henry Norris chaired the last meeting of the London Borough of Fulham before the local elections. Sir Henry was now standing down after becoming the longest serving London mayor of all time. 15 October 1921: Arsenal 1 Sunderland 2, the second of four consecutive defeats in a run of 12 matches from the start of the season, in which Arsenal won 2, drew 1 and lost 9. Arsenal and Cardiff were classed as joint 21st in the league as they had the same points and goal average. 15 October 1932: George Male’s first appearance as a right back v Blackburn. The story is that Male didn’t believe he could play right back but a chat with Chapman convinced him he “was the best right back in the country”. And so he was. 15 October 1963: Arsenal drew 4-4 with Tottenham at Highbury. Eastham 2, Baker and Strong got the goals. It was part of a run that saw Arsenal score 17 goals in five games, but only gain three wins. 15 October 1966: Bob McNab made his debut v Leeds United in a 1-3 defeat. Despite the result he kept his place making 25 appearances in that first season. In 1967 Court regained his place but by October Bob was back, although this time at left back. 15 October 1971: Andrew Cole born. He signed for Arsenal in October 1989 but only made one appearance in the league and after a loan spell at Fulham went to Bristol City. 15 October 1972: English football was hit by a sensation, as Brian Clough and Peter Taylor left Derby County following a dispute with the club’s directors. Derby had won the league in 1971/2 and this episode was the start of a life-long tirade by Clough against club chairmen and directors. The Derby fans were mutinous. 15 October 1977: Arsenal 1 Queen’s Park Rangers 0, 36,290 in attendance. “We came here to frustrate them,” said Rangers’ manager Frank Sibley, “and to make them play badly.” Eight behind the ball was the minimum, rising to all 11 on occasion. The goal came as a loose ball was punted in by Macdonald leaving QPR not the first team to realise how hard it is to go from mass defence into any form of attack. 15 October 2016: Theo Walcott scored his fourth and fifth league goals early on, Xhaka was ludicrously sent off , Özil scored on his 28th birthday, as Arsenal moved joint top of the league with Man City- the result making this five wins in a row in all competitions. 16 October 1909: Arsenal lost away to Sunderland 6-2; goalkeeper Hugh MacDonald returned but was probably still not fit. However the keeper kept his place for the rest of the season and Arsenal won the next match 1-0. 16 October 1919 Frederick Pagnam signed from Liverpool, after standing out against the match fixing scandal that besieged Liverpool and Man U. The transfer was one of the first episodes that disproved the “Knighton Thesis” that the manager had his scouting networks wound up by Sir Henry Norris. 16 October 1926 Arsenal 2 WHU 2 leaving Arsenal with just one win in nine, with Lambert and Brain scoring. After coming second the season before there must have been disappointment, but the crowds kept on growing. 35,534 turned up for this game. 16 October 1954: Wally Barnes won his 22nd and final cap for Wales. Ralph Guthrie played his second and final game in goal for Arsenal, a 0-1 home defeat to Portsmouth. 16 October 1965: Arsenal lost away to Blackpool 3-5 – the last five goal defeat until the 70/71 Double season when Arsenal lost 5-0 to Stoke. Armstrong and Radford plus an o.g. were gave Arsenal their goals. 16 October 1961: Paul Vaessan born. Arsenal was his only club, his sublime talent and promising career cut short by injury. 16 October 1976: Arsenal 2 Stoke 0. The 353rd and final league game for John Radford v Stoke City. Rice and Macdonald scored for Arsenal’s 5th win in nine. 16 October 2004: The last of the great 49 unbeaten, a 3-1 home win over Aston Villa. The victory made it eight wins and a draw so far in the season. Pires got two and Henry the other. 16 October 2012: Steve Gatting took over as under 18s coach having previously worked at Christ’s Hospital school in the same position. 17 October 1902: Fergus Hunt rejoined Arsenal from WHU. However he only played three games but then moved on to Fulham. Later he played for Burton United and Shildon Athletic and retired from football in 1907. 17 October 1914: Harry King makes it 10 goals in nine games in Arsenal 2 Blackpool 0. He ended the season with 26 goals in 37 league games. 17 October 1947: Thomas Fitchie, the only man to be signed five times by Arsenal, died. He was a travelling salesman with Jacques & Co a sports goods and games manufacturer. They encouraged his football career as an amature as it allowed them access to the clubs and the players who were his team mates. 17 October 1951: Arsenal’s 2nd match under floodlights. Arsenal 3 Rangers 2. 62,000 were present. 17 October 1953: A 2-5 home defeat to Burnley on this day followed a 4-1 away win at Tottenham, and this in turn was followed by a 5-1 away win at Chelsea. 17 October 1970: Arsenal 4 Everton 0. A hammering of the champions served notice that there was something special about this team. League match 13 of the first Double season. Arsenal up to second. 18 October 1919: First match for Stephen Dunn – a 1-1 home draw with Everton. He was a goalkeeper who also played for the first team as a full back when he injured his wrist. 18 October 1924: Final game for Robert Turnbull; he became Arsenal’s most prolific scorer thus far (with 22 goals) after being switched from fullback to centre forward. After this last appearance he was put on the transfer list and sold to Charlton Athletic in November. 18 October 1948: Wally Barnes international début. He went on to play a 22 games for his country and scored one goal. 18 October 1985: Bryn Jones died. After leaving Arsenal in 1949 having played 71 league games he coached at Norwich from 1949-51 and then ran a newsagent’s shop in Highbury. 18 October 2014: A 2-2 home draw with Hull meant that Arsenal had won 2, drawn 5 and lost 1 and languished in 7th. The totally untrue story that this was Arsenal’s worst start in 30 years circulated in a vain attempt to put pressure on the manager. 19 October 1889: Arsenal beat Dartford Working Men’s Club 7-1 in the first round in the Kent Junior Cup starting their journey to the club’s first ever piece of silverware. 19 October 1912: Arsenal 1 Sunderland 3, in Arsenal’s relegation season. But the rumours were circulating that this would be Arsenal’s last season in Plumstead. 19 October 1946 Albert Sigurður Guðmundsson played first of two league matches for Arsenal. He was the first ever Icelandic professional footballer and later became Minister of Finance of his country. 19 October 1999: After a 1-1 draw in Barcelona, Arsenal lost the return game at Wembley 2-4; their first defeat in the series. Bergkamp and Overmars scored. 19 October 2002: The all-time away win sequence ended with a 2-1 defeat by Everton, the start of 3 defeats in a row, the worst run for 19 years. It was the first defeat of the season, Rooney scored his first goal, in the last minute. Arsène Wenger said, “At that age, Rooney is already a complete footballer. The guy can play. He’s the best English under-20 I’ve seen since I came here.” 13 years later he became England’s all time top scorer. 19 October 2010: Arsenal beat Shakhtar Donetsk 5-1. The goals came from Song, Nasri, Fabregas, Wilshere, Chamakh, meaning Arsenal had played three, won three and scored 14 goals. 19 October 2011: Arsenal beat Marseille 1-0 away in the Champions League, with a goal from Ramsey in the 92nd minute. Arsenal remained unbeaten in the group. 20 October 1905: The earliest history of Royal Arsenal and Woolwich Arsenal known to have been written was published in the part-work, the Book of Football. It was written by the club’s vice-chairman, Arthur Kennedy. 20 October 1906: A 1-0 win over Notts C gives Arsenal seven wins in the first nine; the club’s best first division start thus far. 20 October 1927: Eddie Hapgood signed from Kettering for £1000. See also here. It was reported that Chapman’s interview of Hapgood included questions about smoking and drinking. After the interview he offered Kettering the fee plus performance bonuses and a friendly match in which Arsenal guaranteed to bring some of their star players. 20 October 1928: David Jack’s debut. Newcastle 0 Arsenal 3. (Thompson 2 and Brain scored). 20 October 1954: Arsenal beat Racing Club de Paris in the Armistice series of games originally instituted by Herbert Chapman. 20 October 1976: Arsenal lost 5-1 away to Aston Villa. Arsenal then went on and lost the next match 1-4 and 1-2. In the fourth game Arsenal beat Birmingham 4-0. 20 October 1984: Ian Allinson started a run of 8 goals in 9 games as Arsenal unveiled their the first ‘big screen’ at an English ground “the first of its kind in English football”. Arsenal beat Sunderland 3-2 to retain top position in the league. 20 October 1987: Steve Morrow played his first senior game for the floodlight opening match at Barnet. He went out on loan to Reading, Watford and Barnet, playing his first Arsenal game proper on 8 April 1992. 20 October 1990: Man U 0 Arsenal 1 – Arsenal deducted two points, after all the players except Seaman got involved in two minutes worth of pushing and shoving. For reasons that were never made clear Man U were only reduced one point, and the punishment was not used again for this type of “offence”. 20 October 1993: Arsenal 3 Standard Liege 0; CWC 2nd round. Wright (2) and Merson got the goals in front of 25,248. 20 October 2001: Arsenal 3 Blackburn 3. League match 9 of the third Double season. Pirès, Bergkamp and Henry scored. It was the seventh consecutive match unbeaten as Arsenal regained top position. 20 October 2007: Arsenal’s seventh straight win in the league beating Bolton 2-0. Rosicky and Toure scored. The unbeaten run lasted 15 games in all. 21 October 1912: Athletic News announced, wrongly, that Arsenal would move to Harringey Park the following summer. The most likely explanation was that Henry Norris had been spotted as he toured the area looking at possible sites although it is quite possible that Norris had his car park at the site, having had his driver drop him off in Highbury. 22 October 1920: Dr Jimmy Paterson joined as an amateur. He had won the league with Rangers, been awarded the Military Cross for bravery in the war, in his memoirs the manager said he was reduced to playing “the brother in law of the club doctor” and complained that he was refused permission by the chairman of signing “real” players. 22 October 1938: Reg Cumner international debut – his first of three caps. He certainly would have had more full caps had it not been for the war. He was one of a handful of players who came through the Margate nursery and went on to play for their country. 22 October 1947: Cliff Holton joined as an amateur from Oxford City initially as a fullback but by the time he made the first team in 1950 it was as a centre forward. His first game was on Boxing Day 1950, and was in the first team for our second post-war Cup Final in 1952. 22 October 1949: Arsène Wenger born. He became Arsenal’s first non-British manager, the longest serving manager, the manager who won the most major trophies, and the man who delivered the Unbeaten Season. For our birthday quiz see here. 22 October 1949: After a reserve team match in Cardiff the South Wales Football Echo and Express reported that Arsenal players had been seen smoking after the match. In November Arsenal announced it was taking legal action against the paper, which immediately withdrew its accusations and apologised. 22 October 1952: Arsenal beat Hibs 7-1 in a friendly. It was the first ever Arsenal match under floodlights which was televised. At the time league games were not played under floodlight so the arrangement was still a novelty. Roper scored 5 and Lishman the other two. 22 October 1963: Alan Skirton scored Arsenal’s first goal in European competition as Arsenal lost 3-2 to Staevnet 2. John Barnwell got the other goal. 22 October 1997: Ian Selley transferred to Fulham for £500,000 (also quoted as 17 October in some sources). He had played 42 times for Arsenal, and after a period also with Wimbledon, and loans to Southend he moved into non-league football. 22 October 2001: Bertie Mee died. He managed Arsenal for 539 games beaten only by Arsène Wenger. But his win percentage was below that of Wenger, Chapman, Allison, Whittaker, Graham, Howe and Neil. He won three major trophies – the same as Chapman – but fewer than Graham (6), and Wenger (10). 22 October 2002: Having lost to Everton on 19 October, Arsenal now lost to Auxerre, and then lost at home to Blackburn on 26 October making three defeats in senior competitions in a row – the worst run in 19 years. 22 October 2005: After only four wins in the first eight league games Arsenal started a run of four wins in five with the 1-0 defeat of Man City. Pires and Henry tried a trick penalty but fail to put in a shot; however Pires scored to secure the points. 22 October 2006: Arsenal made it six wins in a row with a 4-0 away defeat of Reading. Henry (2), Hleb and Van Persie got the goals. 22 October 2014: Anderlecht 1 Arsenal 2 in the Champions League on Arsène Wenger’s 65th birthday. Arsenal played Emiliano Martinez in goal having Szczęsny suspended and David Ospina injured..
23 October 1893: Woolwich Arsenal beat Roston Bourke’s XI 4-3. It was one of many friendlies played in the season, made particularly intriguing by the fact that Roston Bourke was a leading referee who also had his own team. 23 October 1909: Woolwich Arsenal 1 Everton 0. After one win and one draw in the first nine, Arsenal secure their second victory, scoring their 10th goal but having conceded 34. 23 October 1935: Arsenal lost a Charity Shield match for the first time ever in a 1-0 home defeat to Sheffield Wednesday in front of 30,000. 23 October 1957: Graham Rix born. He joined Arsenal in 1974 while Bertie Mee was manager, and turned pro in 1975. His first ever match for Arsenal was against Leicester on 2 April 1977. 23 October 1994: Freddie Ljungberg made his debut for Halmstads. He played 79 games for the team before moving to Arsenal in 1998. 23 October 2007: Arsenal beat Slavia Prague 7-0 in Champs League. Eboue and Walcott each got two. 23 October 2007: Jens Lehmann made an infamous speech in which he spoke of “my dear manager” and detailed the “humiliation” he felt of being dropped. Mr Wenger said later that “Jens always thought he was right about everything”. 23 October 2010: Mark Randall loaned to Rotherham. It was his third and final loan from Arsenal before he moved to Chesterfield in 2011. 24 October 1883: George Allison born in County Durham. Bernard Joy said “he lacked the professional’s deep knowledge of the game”. But he still managed to win the FA Cup and the League twice and from 1910 onwards had a continuous and deep engagement with the club. 24 October 1896: Arsenal beat Gainsborough Town 6-1 away (Boyd 2, Brock 2, Haywood, Russell). It was the biggest away win thus far for the club, and the biggest in the 19th century. 24 October 1936: The East Stand, Highbury opened for game against Grimsby. It cost £130,000. With the West Stand opened three years earlier, Chapman and Norris’ vision for the stadium neared completion. 24 October 1949: Len Wills signed as a professional. Arsenal was his one and only club as a professional. 24 October 1956: Tom Whittaker died while manager of Arsenal. In nine seasons as manager he won the league twice and the FA Cup once taking over from George Allison, and winning the league in his very first season. 24 October 1970: Coventry 1 Arsenal 3. League match 14 of the first Double season. Kennedy Radford and Graham scored and it gave Kennedy nine goals in the last seven games. 24 October 1997: Glen Helder transferred to NEC Breda after 39 league games for Arsenal. However he didn’t settle at any of his seven subsequent clubs, never managing more than ten games for any of them. 24 October 2006: Armand Traore made his first appearance as a substitute for Adebayor. Arsenal beat WBA 0-2 away in the League Cup. Aliadière scored both goals as Arsenal started the journey to the final. 24 October 2010: Arsenal beat Manchester City away 3-0 to move up to second. Nasri, Song and Bendtner scored. City’s Boyata was sent off on five minutes. 24 October 2012: Arsenal lost at home to Schalke 04 – first home defeat (and as it turned out, the only defeat) in the group stage this season. 24 October 2015: Arsenal beat Everton 2-1 to go top of the league for the first time in the season. It was the fourth successive win and achieved by goals from Giroud and Koscielny in a two minute spell in the first half. 25 October 1919: Arsenal 1 Bradford C 2. League debut for Fred Pagnam, the man who refused to be corrupted by Liverpool’s match fixing exploits. Arsenal then went the next six games unbeaten. 25 October 1924: Debut for Jimmy Brain v Tottenham in front of 51,000 at Highbury. He scores when the ball hits his head and knocks him out. He later became a player and coach at Tottenham but eventually ended up as an Arsenal scout. 25 October 1952: Arsenal 3 Newcastle 0. The crowd of 63,744 meant that 186,104 paying fans had seen Arsenal’s three home games in October. Of the 8 goals scored in the month Roper got five, Logie two and Lishman one. 25 October 1958: Mike Tiddy transferred to Brighton. It was at Brighton that he became known as a Methodist lay-preacher and apparently because of his role as a preacher, he never played Christmas and Easter fixtures. 25 October 1980: Pat Rice last game in a 1-1 away draw with Sunderland. In his time at Arsenal as a player he won the league and two FA Cups, plus further honours as subsequently he became assistant to Arsene Wenger. 25 October 2011: Arshavin and Park score in the 2-1 league cup win over Bolton. Muamba scored for Bolton. Arsenal lost in the next round to Manchester City. 26 October 1863. Representatives of several football clubs met at the Freemasons Tavern, Holborn and formed the Football Association after Ebenezer Morley wrote to Bell’s Life newspaper, suggesting that football should have a set of rules. 26 October 1881: Tim Coleman born in Kettering. He played 196 times for the club before being sold in 1908 to help try and reduce the club’s debts. 26 October 1889: Arsenal played Thorpe (Norwich) and drew 2-2 in FA Cup. Thorpe declined the chance of a replay because of the cost of travelling to Plumstead so Arsenal went through. 26 October 1903. Arsenal won their 8th match in a row from the start of the season beating Leicester Fosse 8-0. 26 October 1932: Alex James final international match. He made eight appearances for Scotland and scored four goals and was one of the Scotland team that beat England 5-1 at Wembley in 1928. 26 October 1938: England beat the Rest of Europe 3-0 at Highbury on a Wednesday afternoon. Early closing of the local shops allowed 40,185 to attend. Hapgood and Copping played. It was the second full match to be shown live on British TV. 26 October 1946: Albert Sigurður Guðmundsson played his final league match for Arsenal – a 2-1 away defeat to Chelsea. 26 October 1974: Terry Mancini’s debut game. 26 October 1997: Arsenal completed a 12 game unbeaten start to the season with a goalless home draw with Villa, 12th league game of the 2nd Double Season The second double: part 1, part 2, part 3. 26 October 2002: After losing to Everton and Auxerre, Arsenal suffered their 3rd defeat in a row, 2-1 to Blackburn making this the worst run in 15 years. Edu scored for Arsenal and conceded an own goal. 26 October 2003: Charlton 1 Arsenal 1. The 10th league match of the unbeaten season; Henry scored the goal. The result meant Arsenal had won seven and drawn three, and remained top of the league. 26 October 2005: George Swindin who played 271 league games in goal for Arsenal and had four years as manager, died in Kettering aged 90 after suffering for some years with Alzheimer’s disease. His last football job was as manager of Corby Town. 26 October 2006: The Duke of Edinburgh opened the Emirates Stadium. The Queen was unable to attend and so the team and Arsène Wenger were invited to the Palace on 15 February 2007, for tea, making Arsenal the first ever football club to be invited to the Palace for tea..
27 October 1913: Jock Rutherford signed from Newcastle for £800. He was regularly in the side up to the first world war, and despite being 35 when the league resumed in 1919 he returned to play for Arsenal in the first division – and continued to do so for four years. 27 October 1919: Tom Whittaker joined Arsenal from the army. He went on to become a first team player, was the club trainer under Chapman, trainer of the England squad, Arsenal coach and ultimately equalled Chapman and Allison’s trophy record of two league titles and the FA Cup. 27 October 1948: Roger Davidson born. He won reserve team honours with Arsenal but only made one league appearance for the club. He later was part of Fulham’s 1971 promotion winning team. 27 October 1951 Arsenal 4 Fulham 3 – the first of three hat tricks in consecutive home games for Doug Lishman. Those three games involved 22 goals and were watched by a total crowd of 161,400. 27 October 1956: Everton 4 Arsenal 0. First match as manager for Jack Crayston. The team were clearly in shock over as they had just won their previous three games scoring 16 goals in total. 27 October 1967: Don Howe became chief coach, 3 months after retiring as a player. He was central to the success in the following years which saw Arsenal’s first European trophy and first Double. 27 October 1973: Gordon Rahere Hoare died. In his football career he had played for 13 clubs and won a gold medal playing for England in the 1912 Olympics. 27 October 1981: Arsenal 2 Sheffield Utd 0 (League Cup) Final game for Willie Young (who scored one of the goals; Sunderland got the other). He had played 170 league games, after which he played for Nottingham Forest, Norwich, Brighton and Darlington before becoming a publican, and running a kennelling business. 27 October 1984: A 3-1 defeat to West Ham was the start for Arsenal of a run in which they won just 12 league games out of 30 between this date and May 11 as they slipped from being top of the table and finished in sixth place. 27 October 1999: Arsenal made it two home defeats in a row in the Champions League losing to Fiorentina at Wembley. They had proven the crowds would go to Wembley, but the results didn’t follow. 27 October 2001: Sunderland 1 Arsenal 1. League match 10 of the third Double season. Kanu scored. The result left Arsenal third – and they were soon to slip to fifth. 27 October 2004: Almunia and Senderos made their debut in a league cup match which ended Man City 1 Arsenal 1. 27 October 2010: In the 4th round of the league cup (after an encouraging 4-1 away win to Tottenham in round 3), Arsenal beat Bolton away 4-0. Walcott (2), Bendtner and an own goal gave Arsenal victory. Arsenal reached the final scoring 15 in the run, but Bendtner was the only player to get more than one goal throughout. 27 October 2012: Arsenal beat QPR 1-0 to bring slight relief after one win in the last four matches. Arteta scored the goal to take Arsenal up from 9th to 6th in the league. 28 October 1893: Arsenal conceded 15 goals in three consecutive games losing 0-5 at home to Liverpool on this day. It was Arsenal’s worst defeat at home equalled only in very particular circumstances on 14 February 1925 in the game against Huddersfield. 28 October 1912: Arsenal reserves lost their 100% record, two of the reserve players were suspended by the FA for playing Sunday football, and the London press retreated on their suggestion that Arsenal was moving to Harringey. 28 October 1922, Bob John league debut: Arsenal 1 Liverpool 2. He went on to play 421 league games for Arsenal and won the FA Cup and three league titles with the club. 28 October 1936: Sunderland 2 Arsenal 1 in the Charity Shield with a crowd of 30,000 at Roker Park. 28 October 1953: Racing Club de Paris 2 Arsenal 4, in the continuing series of matches to raise money for ex-servicemen, initiated by Herbert Chapman. 28 October 1975: Graham Rix debut in a testimonial at Charlton having been signed by Bertie Mee. However he had to wait until April 1977 to make his first league appearance. 28 October 1997: First and last appearance for Isaiah Rankin in away game against Tottenham. His career took in 14 clubs with his most games played in a two year spell at Brentford. He finished his career at Hendon in 2014 after 394 games and 73 league goals. 28 October 1998. Remi Garde became the first non-UK/Ireland national to captain Arsenal in Derby 1 Arsenal 2 in the league cup. Vivas scored – the other was an own goal. 28 October 2000: Arsenal 5 Manchester City 0. It was the fourth of five consecutive wins. Cole, Bergkamp, Wiltord and Henry (2) got the goals. It was the second of five games in the season in which Arsenal scored five or more in the league. 28 October 2003: Debut for Cesc Fabregas to make him at the time Arsenal’s youngest player aged 16 years 177 days. The game ended 1-1 and Arsenal then beat Rotherham in the league cup 9-8 on penalties. Wiltord took the first (and missed) and the winning kick at the end. 28 October 2007: Arsenal drew 1-1 with Liverpool after seven straight league wins. Gerrard gave Liverpool the lead on seven minutes and Fabregas equalised on 80 minutes. 28 October 2008: Freddie Ljungberg signed for Seattle Sounders after an unhappy time at WHU for whom he played 25 games. He retired in 2012, but returned in 2014 to play for Mumbai City before starting a coaching career at Arsenal. 28 October 2009: Arsenal reserves beat Liverpool 2-1 in the league cup. Merida and Bendtner got the goals. 29 October 1892: Royal Arsenal almost emulated their FA cup record victory with a 10-1 defeat of City Ramblers. Booth, Elliott and Henderson all got hat tricks, with the other goal coming from George Alexander Davie. 29 October 1908: Alex Wilson born in Lancashire, and played for Overton Athletic and Greenock Morton winning promotion to the first division with then in 1929. He was signed by Chapman in May 1933. 29 October 1911: Bernard Joy born. He played university football and then went on to play for the amateur side Casuals and won the prestigious FA Amateur Cup in 1936 plus ten caps for England amateurs as well as playing for Arsenal. 29 October 1932: Arsenal 8 Leicester 2, continuing a run of 9 wins, drawn 2 and lost 1 in the league. Hulme 3, Bastin 2, Coleman 2, Jack got the goals in front of 36714. 29 October 1965: Jimmy Magill transferred to Brighton after playing 116 games for Arsenal. He also played 26 times for N Ireland. In 1969 he moved to Denmark and had a successful career as a manager before stepping down for the last time in 1996. 29 October 1973: Robert Pirès birthday. Robert had a Portuguese father and Spanish mother and found learning both French and English difficult. After he had left Arsenal to play for Villareal he did an interview in fluent Spanish and the UK journalists, having not done their homework and not realising Spanish was one of his native tongues berated him for not having bothered to learn English properly. He scored a hat trick in the first game of the “49”. 29 October 1977: Trevor Ross played his last game for Arsenal. His transfer to Everton took several weeks to complete, and during that period he had a major falling out with Terry Neill. 29 October 1983: Tony Woodcock scored five against Villa by the 48th minute. Final score 6-2. In all he scored eight in three consecutive matches. 29 October 1994: Everton 1 Arsenal 1. This was the start of an 18 match sequence in which Arsenal scored 16 goals, winning just four games. The problem with scoring was reflected in the end of season stats: Wright got 18, Hartson 7 and no one else more than four. 29 October 2008: Arsenal 4 Tottenham 4. Bentley scored against his old club – perhaps the highpoint of his career. Silvestre, Gallas, Adebayor, van Persie scored the goals for Arsenal. 29 October 2011. Chelsea 3 Arsenal 5. Van Persie scored three, to make it three wins in a row for Arsenal in a run that continues for eight games until 10 December. 30 October 1897: Woolwich Arsenal beat St Albans 9-0 in FA Cup. This time there was only one hat trick (Hunt) with the other goals coming from Brock, Haywood, Steven, McGeoch, Davis, and Farrell. The crowd was just 3,000. 30 October 1909: Man U 1 Arsenal 0; commentaries in the press focussed on the dangers of the pitch in terms of the health of players and spectators. It was placed beside a chemicals factory. Man U moved to Old Trafford in 1910. See also here. 30 October 1920: Debut of Dr James Paterson: Arsenal 2 Derby 0. This was the 12th league match of the season, but only Arsenal’s 3rd win. Dr Paterson achieved the rank of major in the war and was awarded the Military Cross. He joined Arsenal from Rangers (with whom he had won the league) sharing house with his brother in law, who was Arsenal’s club doctor. 30 October 1937: Arsenal 1 Middlesbrough 2 – a result that meant Arsenal had won only two of the last ten league games, despite winning the first three scoring 12 conceding two. As a result of the run, this game marked the final appearance of Ray Bowden and Bobby Davidson (see below). Also it was the final game for Herbie Roberts who broke his leg in this game. Despite two more games after this without a win, Arsenal recovered and went on to win the league. 30 October 1937: Ray Bowden’s final appearance. An ankle injury caused him to be sold to Second Division Newcastle United for £5,000. In all he played 138 matches for the Gunners, scoring 48 goals. Later playing for Newcastle he scored a hat-trick against Swansea on the day before England declared war on Germany in 1939. 30 October 1937: Bobby Davidson’s last appearance. The high point of his career at Arsenal was four goals in the 5-1 victory over Portsmouth in December 1936. He was transferred to Coventry City in exchange for Leslie Jones. 30 October 1937: Herbie Roberts last appearance, in a game in which he broke his leg. In all he made 335 starts for Arsenal including 297 in the league, and scored four league goals with one more in the FA Cup. But above all he is remembered as the centre half at the heart of Chapman’s revised WM system in 1925. 30 October 1941: Bob Wilson born. He went to Loughborough College (now university) to train as a teacher, played a few reserve games for Wolverhampton and made his début for us while still having the status of an amateur in 1963. It is said that the £6000 we paid for him was the first transfer fee paid for an amateur. 30 October 1982: Arsenal 0 Birmingham 0, part of a run of just one win in seven. Danny O’Shea’s first game. was born in Newington, came through the youth system at Arsenal and was captain of the youth team. 30 October 1993: Arsenal 0 Norwich 0 – the fourth consecutive goalless draw. Arsenal only scored more than one goal in a league game at Highbury this season in six games. 30 October 2009: Possibly having been encouraged by Tottenham fans, or possibly just through an unwillingness to do proper research, The Guardian reprinted the story about Arsenal gaining promotion in 1919 through some corrupt means. As always there was no evidence presented to back up the case, and no serious presentation of the mass of evidence to the contrary. The real story of the 1919 promotion is told here and further research recently published on the Arsenal History site add more to support this evidence. 31 October 1898: Arsenal 5 Brighton United 2 in the third and final season of the United League. Although Brighton Utd faded from history, they are better commemorated than many teams as one of their directors was a professional photographer. They also played in the Southern League. 31 October 1932: Gillespie Road tube station became Arsenal (Highbury Hill). The Highbury Hill element of the name was later dropped as the station adopted its long term name of Arsenal. (“Chapman’s achievements“). Many sources wrongly quote this as happening in November 1932. 31 October 1970: Arsenal 2 Derby 0. Goals from Kelly and Radford. League match 15 of the first Double season in front of 43,013. It was one of four successive games in which Radford scored. 31 October 1984: Arsenal lost 2-3 to Oxford Utd in the Milk Cup 3rd round. Rix and Allinson scored in front of 14,393. It was sandwiched between league defeats to West Ham and Man U. 31 October 1998: Arsenal started a run in which they scored just three goals in six games with all three scored by Anelka. The sequence yielded two wins, three draws and one defeat. 31 October 2000, George Armstrong suffered a brain haemorrhage while running a training session. He did not recover and tragically died 1 November aged just 56. 31 October 2009: Arsenal made it 3 league wins and a draw beating Tottenham 3-0 at home with a record Emirates crowd (at the time) of 60,103. Van Persie (2) and Fabregas got the goals. The anniversaries file aims is the biggest database of Arsenal events ever produced. However in trying to build it I always openly acknowledge that some of the details recorded here will be wrong, and facts will be inaccurate and will need correcting, not least because information may be taken from inaccurate sources, or (in my specialist way) I may have made copying and typing errors. So far over 250 people have contributed to the articles that make up the anniversary files, and if you can help us improve the data, please do either comment on an article (and I’ll correct the file itself), or write a new article for us. A correction and a citation of sources would be good however, rather than just saying “you’re wrong”. A special mention as always must go to Andy Kelly and Mark Andrews, who helped with the early development of this site. But whether you can add original research or corrections with the right data, or articles on people we have not yet covered, that will be very welcome indeed. The dates in this file are being added to all the time, and come from a whole variety of sources including the internet and a variety of printed volumes. If you notice an error please write to Tony@schools.co.uk – ideally with a correction and a note of your source. I would particularly like to mention Richard Lerman and David Brown, and their wonderful (but now tragically out of print) volume “The Gunners: Day to Day Life at Highbury”, which is a mine of information. Also to “Arsenal On This Day” by Paul Donnelley (Pitch Publishing). Also where would any of us be without “Arsenal a complete record” by Fred Ollier (Breedon Books), and “Arsenal the football facts” by Dean Hayes (John Blake). If I have missed another sourcebook, please do let me know and I will correct this at once. If you know of any anniversary dates not yet listed, please do write in and add them. Not only are new dates being added at the rate of about half a dozen a day, but so are links being added to articles on this site. It is intended to produce a book based on this site in due course – but the date gets put back as I find more and more info.